carrying burning flames of righteous indignation. by the army of the dispossessed. And I felt so connected. like the dawn of a new day of justice and equality. All our pain carried away on the wings of a freedom song. What innocent hope, what sincerity. our raised fists in the innocent air ringing with freedom songs. doused him in petrol and set him on fire. that kept us chained to our shamed identity. coming back to haunt us again. closed on our hoping fingers. Phillippa Yaa de Villiers was born on February 17, 1966 in Halfway House close to Johannesburg. She studied journalism in Grahamstown and theater in Paris. In the late 1990s she returned to university to earn a degree in dramatics arts, thereby combining her two passions, writing and performance. She also spend some time in Los Angeles, U.S.A., before she returned to settle in Johannesburg. De Villiers makes her living by working for theatre, teaching and writing for stage and television. 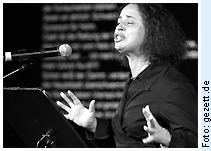 As a poet she has performed her poetry all over the world, f. e. in Adelaide, Havana, Birmingham, Durban, Stockholm, London, Berlin and Johannesburg.